INTERNET SERVICES. Setting up a Commercial Web Site. A Domain name is your webBIZ personality and address combined. It's important in many ways - to numerous to mention here - BUT be very aware when you choose a Domain Name that it has to serve numerous functions. It identifies the commercial personality of your site. It affects the Search Engine friendliness of your site. There are numerous sites on the web which deal with the search and registration of domain Names, and issues relating to them. If you'd like a comprehensive understanding of the issues related to domain names then Domain Name Topics is a good place to start. Alternatively you can SEARCH For A Domain Name here. Summary: Your Domain Name serves many functions. It will have an effect on the *memorablity/findability* and keyword/Search Engine friendliness of your web site. It's hard to make a call on which of these three - Domain Names, List Servers, Web Hosts - are more important than the other in relation to your web business. In actual fact they're all equally important... for different reasons. LIST SERVERS and email marketing will be discussed more fully in the Web Site Promotion - Techniques/ Technologies Directory sections. However they need to be factored into your thinking at the set-up stage. This will save you a lot of grief later. LIST SERVERS are important because they automate the functions related to your email list. An EMAIL list is important because it is one very powerful way for you to communicate with your customers. How do you generate customers? Well, one very common way to do this is to provide an OPT-IN ezine for potential customers. OPT-IN lists are so important, and so valuable that every method conceivable is used to extract that ever-important email address from a web site visitor. Some of these methods are less than honest. However, this practice still serves to make the point about just how important LISTS are to web business. So, as these LISTS are so important to your ongoing success on the web doesn't it makes sense to invest wisely in a system that handles this function? I think so. All of the list servers (below) are professional, web-proven systems. Although they may differ with some of their features each one has an impressive reputation in the *email-handling* business. Summary: Choose your email list handler wisely. It will have a profound impact on the success of your web business. Reliable WEB HOSTS are important if you choose to create your web site using a web design program. If you choose this path then you'll need a "home" or *host* for your site. More information on these options is provided in the "Web Site" sections below. For now, let's assume that you've chosen an offline system, and therefore need a web host. How do you determine which hosting service is the right one for you? This excellent article eloquently covers the essentials of choosing an appropriate ISP ... How To Choose A Web Hosting Service. The most important thing to do before you commit to any web host for your web site is to research. Remember, ISP's are NOT all the same, and some may not have the facilities to support what you have planned for your web site. Ask first! OR... hang out in Forums and Discussion groups. Ask people questions. You'll be surprised the degree of help you'll get. One of my favorite forums is Promote-ivator. It's actually a very clever destop system which links to an online forum. Although the forum focus is on Internet Marketing you'll find many, many knowledgeable people to exchange ideas with on Promote-ivator. Other than this it's a matter of using your trusty Copernic to hunt down appropriate forums. Summary: There are many options when it comes to ISP's. First understand what technical features your site needs (and will need), and then RESEARCH to find the best provider. Option One... Hire A Designer. If you have a sizeable budget then this is a decent place to start. Caution: Having your web site designed by a designer can cost a LOT of money. Like ALL things in life you ultimately get what you pay for. Web Design is no different. BEFORE you even speak to a designer you need to think through what the purpose of your web site is. These are some questions you might ask yourself. Is my web site meant to sell a product or service? Will my site cater for existing customers (offline) or is it meant to attract new customers? What interactive elements do I want my site to have? What information gathering systems do I intend to have on this site? What "value" do I intend to exchange for people coming to my site? What is my site's Unique Selling Proposition? You'll notice that NONE of these points mentions the look of the site. They're all focused on what problem your site solves for people. Your site's "look" should deliver your Unique Selling Proposition. It's a function of your USP. MYSS2002 is the single best investment you can make on this crucial subject, and it is now widely regarded as being The Bible of selling on the net. Once you're armed with these questions you can either research the net for a web design firm in your area, or go to eLance.com, which claims to have the world's largest database of web design, graphic design, and admin projects! Option Two... Doing It Yourself. If this is the path you choose then, you either already have developed web site design program skills ... or, you're going to have to learn some new skills. There are many different web design programs available. Two of the best options are DREAMWEAVER by Macromedia or Microsoft's FRONTPAGE 2000. Information on DREAMWEAVER and FRONTPAGE can be found here ... chumbo.com - the ultimate source in software! Alternatively, if you're intent on using the do-it-yourself approach, but don't know where to start The Newbie's Club's First Website Builder Course will certainly help you to get started quickly. Option Three... Using An Online System. With the previous option you created your web site using a web site design software program, and then uploaded it to your server. With this option Using An Online System you create your web site online. There are numerous online systems, to numerous to detail here. Each of them have different features. Some of them work better than others. The Sitesell system is a robust online system with many added features such as SBI Manager (which finds keywords for you, and has a whole arsenal of data gathering features...) It's magic! SBI just does so many things. It registers and analyzes your site's pages with the Search Engines as you build them. This means there are no more concerns about SE ranking/ compatibility with the SBI system. SBI also hosts its own ezine builder + a spam checker, PLUS... PLUS... PLUS... [new functionality is being added all the time]. The only [current] downside of the SBI system is its lack of an integrated ecommerce facility... but this feature [plus a 2 Tier Affiliate System] is being integrated into the [soon to be released] SBI-E system. SBI-E will be released in the new year. Sitesell's Site Build It! system is NOT just a web site syetem, but an entire e-commerce/ web business system... and it's all integrated into the remarkable ONE package. Basically, if you can point and click a mouse button then you can run a web business with SBI. AND... if this were not enough Sitesell's support is legendary. Frankly, I'm a fan. To see how Site Build It! is used, and the extraordinary results that a variety of webmasters have experienced with their SBI! systems go to SBI User Reviews. So, there you have it ... a broad brushstroke of all the critical elements and issues to consider when Setting Up A Commercial Web Site. These above are the basics for setting up a commercial web site. HOWEVER... all of this information cannot be covered on one web page. 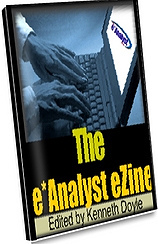 These and other topics will be discussed in-depth in The e*Analyst ezine. -------->> T E S T I M O N I A L <<-------- "The e*Analyst is a great learning resource! It cuts through all the marketing hype and gives you the facts!"